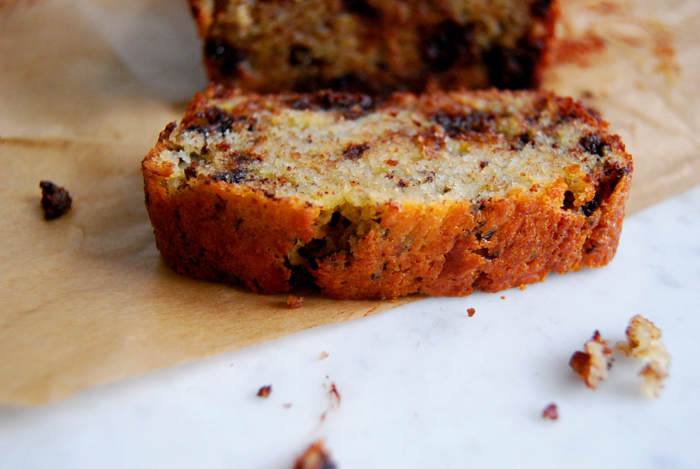 This is another perfect weekend breakfast treat, Banana Chocolate Bread. I like mine juicy, almost moist, with lots of big pieces of banana and bittersweet chocolate chunks. When you take the bread out of the oven, golden and warm and you cut the first thick slice off the loaf, pushing the knife through sweet banana chunks and melted chocolate, you’ll understand why there’s no better start to the weekend. It feels, smells and tastes just right! I never wait for the bread and chocolate to cool, I have to eat a slice immediately as soon as it’s done, the chocolate still warm and liquid. The combination of banana and bittersweet chocolate is a special one as the sweetness and the bitterness balance each other out perfectly. I love it in ice cream, cookies and cakes, but to me nothing beats this duo when their big chunks merge into a warm cake, or morning bread. For one loaf I use three big bananas and 100g / 3.5 ounces of bittersweet chocolate, I don’t want a hint of their flavours, I want an explosion on the taste buds. Set the oven to 160°C / 320°F (fan-assisted oven) and line the loaf tin with parchment paper. Combine the flour, baking powder and salt. Mix the butter together with the sugar and vanilla sugar till fluffy. Add the eggs, one at a time, and continue beating for a couple minutes. Add the bananas, beating for 10-20 seconds and stop before they get too smooth, they should be a bit chunky. Gently fold in the flour mixture with a spoon, add the chocolate chunks and fold them in, carefully as well. Scoop the dough into your prepared tin and bake for 55 minutes or until golden brown. Check with a skewer, it should come out clean. This is divine! Such a treat. I love making banana bread/muffins. The addition of good quality dark chocolate takes it to the top! I think it is the amount of butter in this recipe that makes it “spongy” and so decadent. 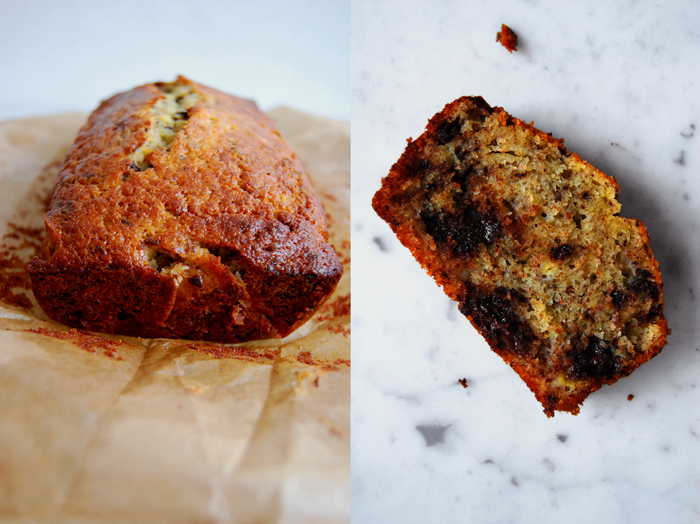 I am with you on the moistness of banana bread. I like to use buttermilk in mine, combined with some canola oil– it also results in really soft and “juicy” texture. (like my banana muffins or whole wheat apple muffins). I can’t wait to bake this bread, Meike! Hello Meike. I just discovered your blog few weeks ago. I’m french and your blog is a fabulous opportunity to improve my English level and to appreciate your marvellous recipes in the same time. 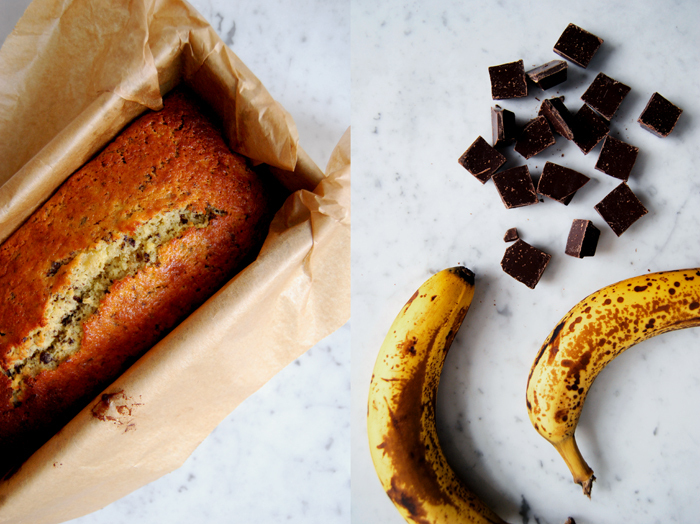 Thank you very much for this banana and chocolate bread recipe. I’ll prepare it soon… no, NOW ! Thank you, I’m happy you enjoy my blog (both for the recipes and to improve your English)! I just ate a slice of it (another one), it’s the kind of cake you can’t stop eating!